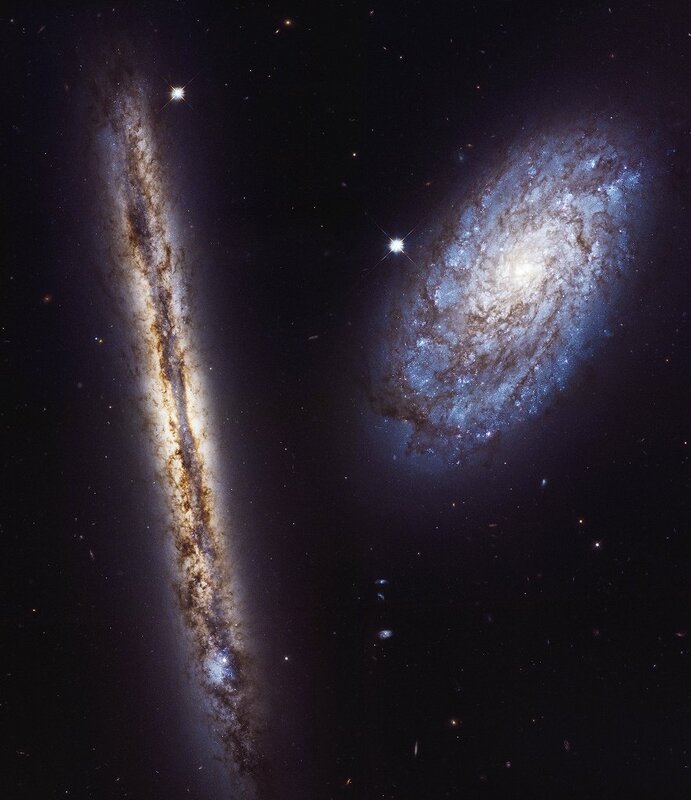 Seen edge-on, spiral galaxy NGC 4302 (left) lies about 55 million light-years away in the well-groomed constellation Coma Berenices. A member of the large Virgo Galaxy Cluster, it spans some 87,000 light-years, a little smaller than our own Milky Way. Like the Milky Way, NGC 4302's prominent dust lanes cut along the center of the galactic plane, obscuring and reddening the starlight from our perspective. Smaller companion galaxy NGC 4298 is also a dusty spiral. But tilted more nearly face-on to our view, NGC 4298 can show off dust lanes along spiral arms traced by the bluish light of young stars, as well as its bright yellowish core. In celebration of the 27th anniversary of the launch of the Hubble Space Telescope on April 24, 1990, astronomers used the legendary telescope to take this gorgeous visible light portrait of the contrasting galaxy pair.